08-24-2011 solidgear3 Description War rages on in the fourth edition of Activision's acclaimed war game. For the first time in the series, Call of Duty moves away from WWII to the modern battlefield. Armed with an arsenal of advanced and powerful modern day firepower, players are transported to treacherous hotspots around the globe to take on a rogue enemy group threatening the world. As both a U.S Marine and British S.A.S. soldier fighting through an unfolding story full of twists and turns, players use sophisticated technology, superior firepower and coordinated land and air strikes on a battlefield where speed, accuracy and communication are essential to victory. The epic title also delivers an added depth of multiplayer action providing online fans an all-new community of persistence, addictive and customizable gameplay. 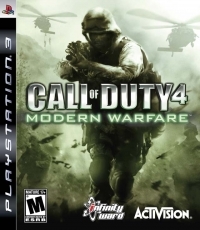 This is a list of VGCollect users who have Call of Duty 4: Modern Warfare in their Collection. 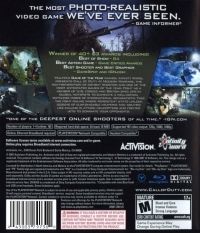 This is a list of VGCollect users who have Call of Duty 4: Modern Warfare in their Sell List. This is a list of VGCollect users who have Call of Duty 4: Modern Warfare in their Wish List. You must be logged in to see Your Stuff.